Bibimbap is a Korean rice bowl. This is a fiddly recipe; not difficult at all, but it takes a lot of effort to put together. However, it looks awesome and contains all the flavors that characterize delicious Korean food: chili, garlic, sesame oil, and sweetness. The very best bibimbap occurs when you heat up a serving-sized stone bowl, drizzle a little sesame oil in it, then put the rice in the bowl and let it sizzle and get crispy on the bottom while you put the rest of the ingredients on top. 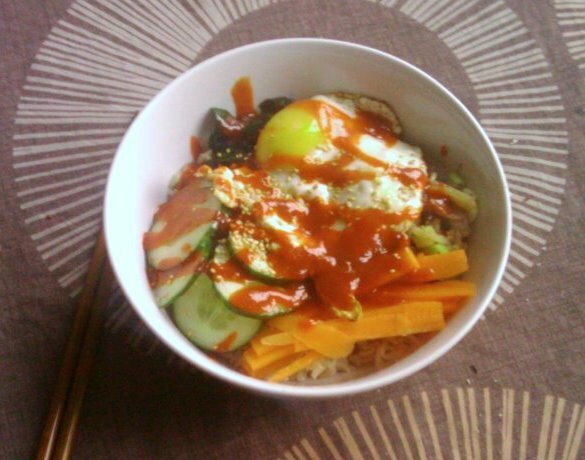 This is called dolsot bibimbap. However, if you’re making this at home for the first time, you likely won’t be able to do that on account of not having stone bowls. I certainly don’t, and so I enjoy it all the more when I go to a Korean restaurant where they do have stone bowls. All the amounts given here are for one person. Since it’s really a bunch of tiny dishes all put together in one bowl for each person, it doesn’t really make sense to make enough for leftovers, because you’ll end up with a bunch of tiny containers in your refrigerator. Just multiply the amounts by the number of people you are feeding. Gochujang is chili paste that is usually sold in a red plastic container with a flip top (I call it a “treasure chest.”) That will be way more than you need for this recipe, but you can always use it up in tteokbokki. Mix the ingredients together and let it sit while you prepare the rest of the meal. Boil the water in a pan. When it boils, add the rice. Lower the heat, cover, and leave, stirring occasionally, for 20 minutes while you prepare the rest of the meal. After 20 minutes, remove from heat. A note here: this is usually done with beef strips but, in a shocking departure from the usual, I actually prefer deep-fried tofu here, because it soaks up the flavors quite nicely, and most grocery-store beef is not good enough quality to be able to pull this off. If you use beef, make sure it’s good beef. You can get pre-fried tofu at an Asian grocery store, or deep-fry it yourself. Whack the garlic clove with the side of a knife blade and then chop it finely. Peel the ginger and grate it. Mix the garlic, ginger, soy sauce, sugar, sesame seeds, oil, and pepper in a bowl. Slice the tofu into strips and coat them in the sauce and leave it while you prepare the rest of the meal. Slice the cucumber very thinly. Slice the carrot into matchsticks. Put the carrots and cucumbers in a bowl, but don’t mix them together. Mix the sugar and vinegar and pour it over the vegetables. Leave it while you prepare the rest of the meal. Slice the mushroom into strips. Heat the oil in a frying pan. Fry the mushroom with the salt and pepper. Mix the oil, honey, and soy sauce. Chop the white and light green parts of the spring onions into thin slices, and chop the dark green parts into 3 cm sections. Fry the spinach until it just turns dark green, then add half the sauce mixture. Stir briefly and remove to a bowl. Put the chopped spring onions in the same pan and fry them, then add the rest of the mixture. Stir briefly and remove to another bowl. By this time the rice should be done. Put it in an individual-sized bowl, and arrange the cucumbers, mushrooms, spring onions, carrots, and spinach in pie-chart sections on top of it, leaving space for the marinated tofu (or beef). Stir-fry the tofu over medium heat for 2 minutes; if using beef, do it for 3 to 5 until the meat is brown. Put it on top of the rice. Fry the egg until the white just starts to bubble. Flip it over and fry the other side, but not too long — the yolk should still be liquid inside. Put the egg on top of the ingredients in the bowl, in the center. Drizzle the spicy sauce on top. Sprinkle the sesame seeds on top. It looks very aesthetically pleasing now, but to eat it, you should mix it all together, breaking the egg yolk and letting it coat everything. Eat it with kimchi on the side. This entry was posted in Light Entertainment and tagged cooking, korean food by Philip Chimento. Bookmark the permalink. I’d love to, but I’m afraid I don’t meet your authenticity requirements – I’ve never lived in Korea. I may need to rethink this a bit, as I’m finding some pretty amazing posts from folks cooking dishes they weren’t necessarily raised with… it’s a small world, as the saying goes!